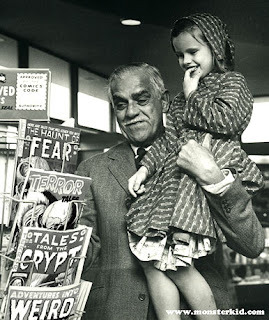 Did you have a Childhood Horror Host? 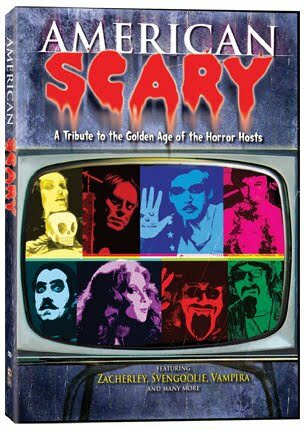 at Egor's Chamber of TV Horror Hosts - this is a fantastic and exhaustive list of hosts from the first hosts (Vampira and Zacherley) to the present day hosts (such as your's truly). 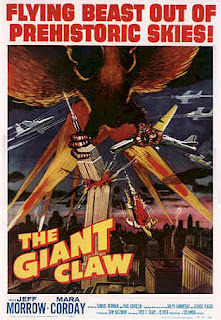 For those of you new to this blog, or my recommended movie of the week series, it isn't really so much a review as it is exactly what the name implies - a recommendation. It is a movie I like and recommend you watch because I feel you'll like it too. 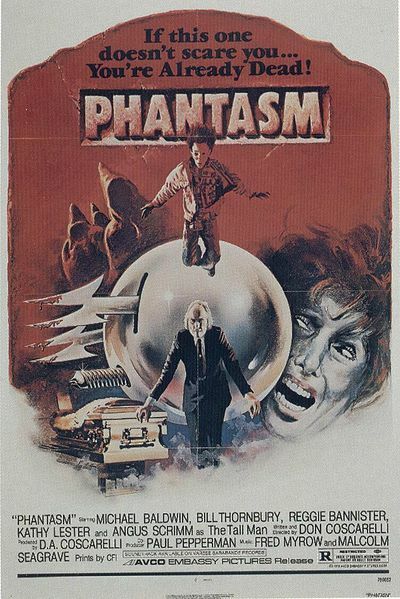 And this week's recommended movie comes from 1979 - it's the Don Coscarelli film, Phantasm, a truly bizarre movie that is absolutely drenched in atmosphere. It is a bizarre film that plays more like a nightmare than a straight forward narrative. 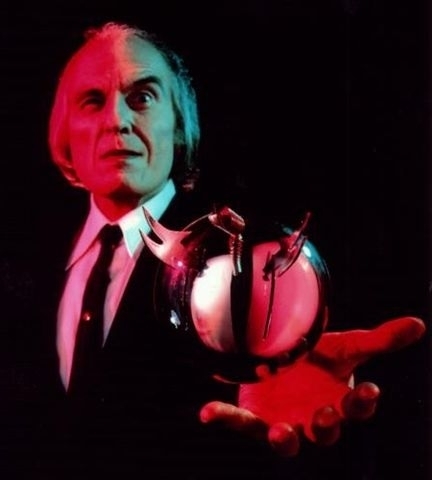 It is a fun ride and spawned three sequels - Phantasm II, Phantasm III Lord of the Dead, and Phantasm III: Oblivion. Back in 2005 I moderated a panel on the Rob Zombie film The Devil's Rejects. This was at the Full Moon Tattoo Festival in Nashville, TN. It was held March 18, 2005, before the movie came out, and features Sid Haig, Bill Moseley, and Ken Foree. Matt McGrory was at the show and supposed to be on the panel as well, but didn't make it to the panel. Horrorblips has made our blog here their featured blog of the week! Horrorblips is a site that collects stories from the web's most popular horror news and blog sites. It's like one-stop shopping for horror fiends! Definitely a site you want to bookmark for daily consumption, as they have links to all kinds of sites...check them out and tell em' Doc Gangrene sent ya! Here's a little Thanksgiving Turkey served up from good ole Doc Gangrene. I have an 8mm castle films version of this movie, and used to project it onto the side of my house when my kids were younger - now my 8mm projector is broken. I have to get a new one. I also have a poster of this movie, believe it or not. I have a real soft spot for this TERRIBLE film! haha! When you're there do yourself a favor and take some time and look around, because there is a veritable feast of fun links and information on this blog. 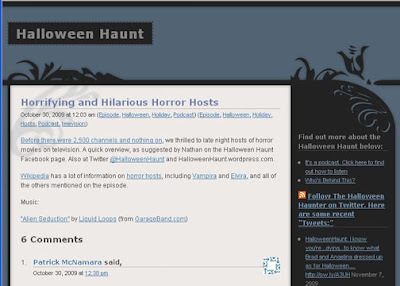 It's attractively designed and organized (love the vintage Halloween art) in a way that makes it very easy to find links to just about anything you could be looking for, from Horror Hosts and Haunted Attractions to comic books and online horror radio programs and everything in between. Definitely a great site, and one to bookmark for sure! 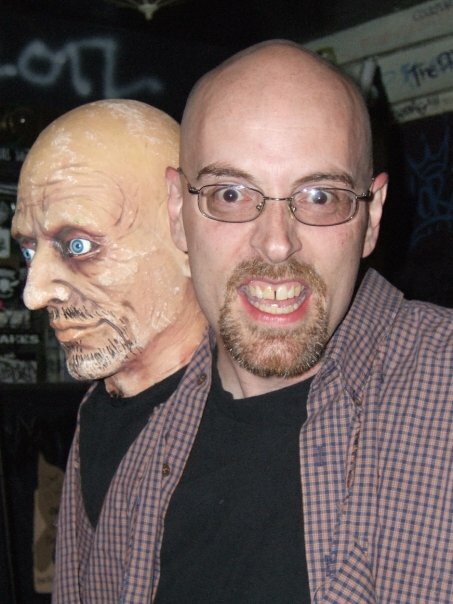 My buddy Max over at Max the Drunken Severed Head blog added a couple of posts about Doc Gangrene over at his site the past couple of days. 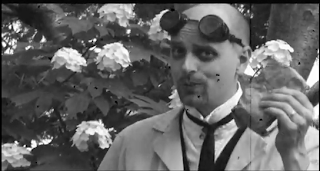 Max has a great blog with entries on all things monster-kid related. check it out at: http://drunkenseveredhead.blogspot.com/ and prepare to spend some time over there as there is a ton to see and more links than you can shake a headless corpse at! November 23rd is the birthday of Boris Karloff, king of the monsters. Happy Birthday Boris - think I'll rewatch "Targets" in your honor. November 23 is also my mother's birthday, which makes it easy to remember good ole Boris' BD every year. I always wished I shared a birthday with someone cool like Boris, but alas, it wasn't to be. Anyway, in honor of Boris' birthday, here is a old radio show featuring Boris - "Death Robbery" from "Lights Out" which aired July 16, 1947 - enjoy! 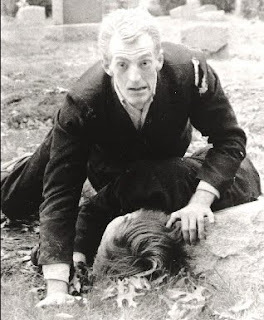 The recommended movie of the week #12 was the George Romero classic, Night of the Living Dead, perhaps the greatest horror movie ever made. Our Werewolf of Nashville PSA got nominated for an Emmy - specifically director Cameron McCasland in the writing category. Congrats Cam!! That's the PSA on cleaning up after your pets in public, and in it I get to throw the line "Remember, it's not what you don't do - it's what you DO do." doodoo. classic. 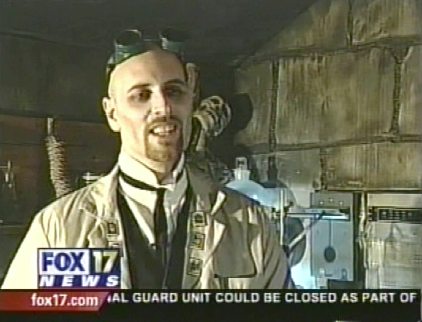 This story ran on the Fox affiliate out of Nashville, TN (WZTV) a few years back when the show was still on cable access. It was part of a series spotlighting various community access shows and their producers. 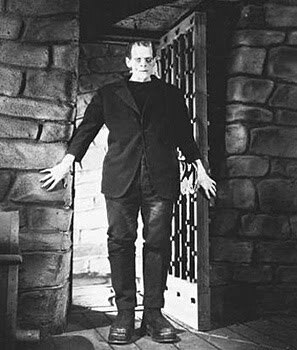 This week Doc Gangrene recommends a tried and true classic - the 1931 Universal film, Frankenstein. A few more shots of me in my Manster costume have surfaced. 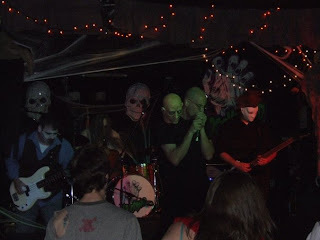 These were taken at the Spookhand show (Punk Rock Party) at The Muse - a HUGE thanks goes out to Angelica Dahl for these. I didn't think anyone took pics that night but lo and behold, there they are. And there she is, the heroine of the day, Angelica with boyfriend McNasty from the Creeping Cruds! I went to the Nashville Opera today for the House of Usher Philip Glass show. Pictured here is lead actress Jennifer Zetlan, who played Roderick's twin sister, Madeline Usher. She is buried alive and comes back from the dead as you see her here, very much worse for wear. It was a beautiful 70 degree day, and as I parked and walked to the Tennessee Performing Arts Center I heard fireworks going off in the distance as the Tennessee Titans, whose stadium is just a couple of miles from there, scored on the Buffalo Bills (Go Titans)! The Nashville Opera asked me to come be a judge for their zombie costume contest... I had wondered how zombies tied into the play, and with the return of Madeline pictured above it made perfect sense. Before the show director John Hoomes did a pre-show talk, giving some behind the scenes information on the play, Philip Glass, and the Nashville production of this play. Afterwards the show began, and it was a multimedia show with giant screens that had imagery and animation projected onto them. The actors interacted with them, and most of the backgrounds and sets were actually projected. It was visually stunning, and quite the unique show. The music was all Philip Glass, and amazing. During the intermission the zombies gathered. I was a judge, along with one of the actors (Paul Dawson) who played the family physician in this performance. and the winner was this lovely paper-mache headed fellow who had a brain and eyeball hanging out of the socket! After intermission they finished the performance, and had a post-show talk with the director, actors, maestro, and special effects technician. 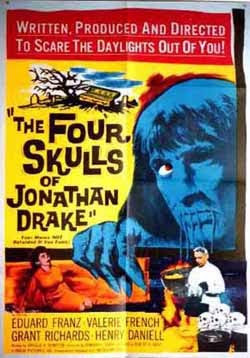 The TOP TEN VINCENT PRICE FILM COUNTDOWN continues with the number 4 entry - so SCREAM, SCREAM for your life with The Tingler!! The Dr. gangrene episode and interview of The Graveyard Show podcast is now available for download at http://caretaker.graveyardshow.com/ - check it out, it's a really good podcast and their older episodes are available for download there, too! Just click the "before there were 2,500 channels and nothing on" link to download it! 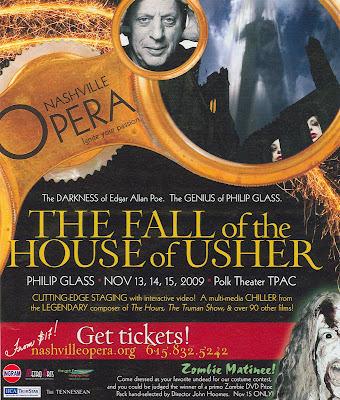 The Nashville Opera is putting on a pretty interesting show this coming weekend - it's The Fall of the House of Usher. This show promises to be a pretty cool one as it features music from Philip Glass and interactive video throughout! The show takes place November 13th, 14th and 15th at the Tennessee Performing Arts Center Polk Theater. There is a pre-show talk as well, one hour before each performance. Join Nashville Opera Artistic Director John Hoomes and members of the artistic staff for a fun informative preview talk, one hour before each performance in the theater. In addition, Sunday, November 15th’s show also features a special Zombie Matinee. Any members of the undead that attend the performance will be entered in a zombie costume contest to win a special Zombie DVD prize pack hand selected by Director John Hoomes. In addition they will be seated in a special “zombie” section, (in the Orchestra seating), which is actually some really terrific seats. 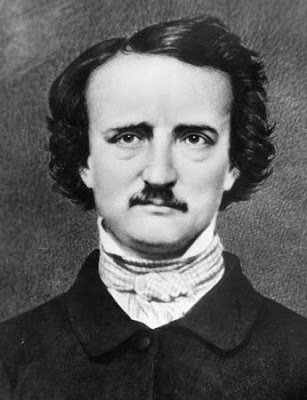 So make plans now to get out to the opera and support this Edgar Allen Poe classic retold through the music of Philip Glass. It’s not all that often the Opera dips into the realm of the supernatural, so let’s shamble out and support this endeavor. I realized I have several youtube videos that I never posted on the blog here - so I'll remedy that over the next week or so. 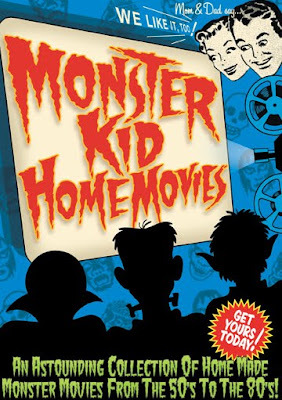 Below is my Recommended Movie of the Week #10 - it is for the Monster Kid Home Movie dvd. This is an awesome collection of home movies made by kids in the 50-70s, shot mostly on 8mm film - and it is one of my favorite dvds. 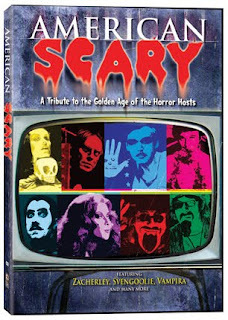 It's a loving tribute to the monster movies we all grew up with, and is one of my favorite dvds. So here it is one week removed from Halloween and the 200th post on this blog. That is a milestone for me - I haven't been that regular of a blogger, instead just writing as the fancy strikes, and this is the second time I've started this blog. Its had a few changes throughout the past 3 years, and has been a cool place to announce news and share my thoughts. My thanks to those of you who visit here regularly. I do hope to continue writing here more frequently over the next year or so. and here's to the next 200 posts on this site!! 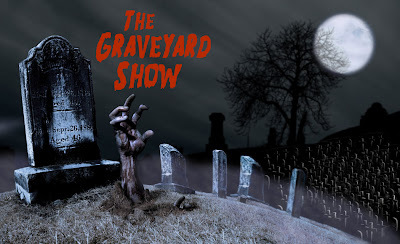 I was interviewed for the Graveyard Show podcast this week - I visited the boneyard and chatted with the Undertaker about my horror career - I tell ya, he's a ghoul after my own heart. The show will be online soon, so I'll let you know when it's available. and tell em' Doc Gangrene sent ya! 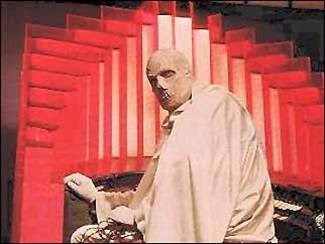 We now continue the Countdown of Top Ten Vincent Price films with the number 5 entry - The Abominable Dr. Phibes and Dr. Phibes Rises Again! I somehow missed getting a physical copy of this paper when it came out. However a co-worker brought surprised me today - She was unaware of my show until after seeing the article in the paper, so she saved it and brought it in for me. "Dr. Gangrene celebrates Halloween year round" - indeed! What was funny was when I called to pay my car insurance this week the secretary there answered and said, "Hey, I saw your picture in the paper this week." So this article is getting some mileage! I had a co-worker snap a pic of me with the article...That's my mp3 player hanging around my neck - I've been listening to the Halloween episode of Rue Morgue Radio. GREAT podcast!! This past Saturday wrapped up this season's Creature Feature Halloween lineup. The movie was "They Crawl" and hoo-boy, what a stinker. Genetically mutated killer cockroaches that terrorize a city and eventually all form together into one giant cockroach that chases our heroes... unfortunately it really isn't anywhere near as cool as that sounds. The CGI reminds me of how good movies are that don't rely on computer effects. In the old days they would have had real live critters - see "Frogs" for a good example of this, or, better yet, "Creepshow" - that one is another roach movie done right. "They Crawl" was made in 2001, so it really has no excuse - special effects and computer generation had come so far by this point that they should have much more realistic bugs than this. 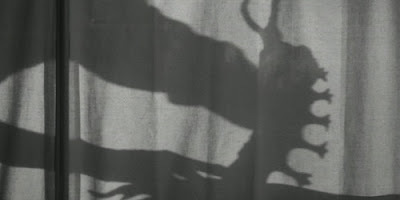 The scene from the the picture above, in particular, was probably the worst of the film – this guy is strapped down and the insects released on him to feed. It is just really, really poorly done. We had fun with it and I think it made for a nice Halloween afternoon Creature Feature. Here’s hoping you all had a terror-ific Halloween. Boo!